Posted in Health & Wellness on February 24, 2010 by FloridaHealth.com staff. Last modified on December 02, 2018. Read disclaimer. Almonds - Rich in vitamins, minerals and iron, almonds offer more calcium than any other nut. They're an excellent source of plant protein, are heart-healthy and contain the type of fat that may help to lower cholesterol levels. 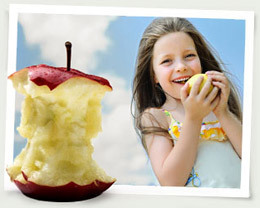 Apples - A delicious source of pectin, a soluble fiber that can lower blood cholesterol and glucose levels. Fresh apples are also good sources of Vitamin C which helps protect connective tissue from damage and keeps capillaries and blood vessels healthy. Blueberries - The phytonutrients in blueberries (also plentiful in cranberries) can help reduce the incidence of urinary tract infections and, perhaps, improve memory and healthy aging. They are a low-calorie source of fiber and vitamin C.
Broccoli - A great source of calcium, potassium, folate, and phytonutrients that may help prevent chronic diseases such as heart disease, diabetes, and antioxidants to help protect your cells from damage. Red Beans - This includes small red beans and kidney beans. Rich in vitamins and minerals, low in fat and calories, red beans are a good source of protein and dietary fiber. Salmon - An excellent source of omega 3 fatty acids which helps prevent blood clots, lowers triglyceride levels, decreases artery-clogging plaques, lowers blood pressure and reduces the risk of stroke. Salmon is low in saturated fat and cholesterol and a great source of dietary protein. Spinach - A low-calorie, nutritional powerhouse. The plant sterols in spinach may boost your immune system and even help keep your hair and skin healthy. Sweet Potatoes - The orange color of sweet potatoes indicates that they're high in the antioxidant beta carotene which, when converted to vitamin A in your body. Sweet potatoes may help slow the aging process and reduce the risk of some cancers. Sweet potatoes are also good sources of fiber, vitamins B-6, C, E, folate, and potassium. They are fat-free and one small sweet potato has as little as 54 calories. Wheat Germ - At the center of the wheat grain is the wheat germ which is responsible for the development and growth of the new plant sprout. It's a highly concentrated source of nutrients including niacin, thiamin, riboflavin, vitamin E, folate, magnesium, phosphorous, potassium, iron, and zinc. Wheat germ also contains protein, fiber, and some fat. Tip: wheat germ is a delicious compliment to yogurt, cereal or fruit or can be used in place of some of the flour in baked goods. Wheat germ should be refrigerated in an air tight container or frozen to extend its shelf life. Fiber -- fewer than half of all Americans get enough of it even though there is an abundance of evidence to indicate that it may help to protect us against heart disease, stroke, diabetes, obesity and more. What foods have fiber? Dried or canned beans, whole grains, nuts, many fruits and vegetables. Calcium -- builds strong bones, may prevent osteoporosis and help manage body weight. What foods have calcium? Dairy foods but also dark greens like broccoli and spinach. If you're eating whole foods and targeting important nutritional needs like these, i think the nutritional gaps will get filled in by themselves. My #1 favorite is dark chocolate (the darker, the better). If I am dragging in the afternoon or I can't get out of bed in the morning, a bite of chocolate seems to work for me as well as coffee and I find that I eat a lot more almonds, bananas, and other healthy snacks throughout the day if I combine them with chocolate. It supposedly contains antioxidants similar to what you get in wine and is good for your mood and your heart. Just look for bars with the lowest sugar and avoid milk chocolate since milk chocolate does not offer the same health benefits as dark chocolate. Also, it should probably be avoided late in the day, I suppose, since it contains caffeine.